There are no available job openings at this time. Interested candidates should submit a resume, references, and writing samples with a cover letter addressing the candidate’s personal goals and interests, as well as his or her experience and interest in working for Chattahoochee Riverkeeper. Specific instructions and required application materials are listed under each internship opportunity. Through the internship program, Chattahoochee Riverkeeper brings students (typically college) and graduates at all levels to our office, where they can work side-by-side with knowledgeable professionals. Interns will receive valuable real world and professional experience and will be an essential asset to CRK’s vital work. We offer internship opportunities in all areas of our work including legal, water monitoring, green infrastructure, social media, event planning, and office management. CRK has technical program internships available year-round to science based college students and graduates for part-time and full-time work. Technical program interns are given opportunities that are hands-on, demanding and rewarding. 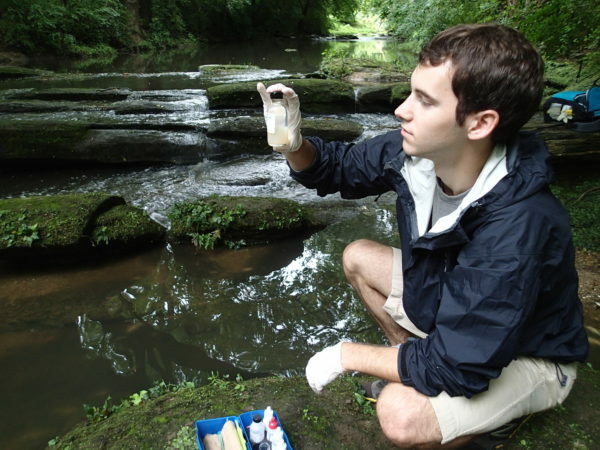 Technical program interns assist our professional staff in a variety of tasks including monitoring and water sample analysis, pollution tracking, data entry and management, research, outreach and education, field work, and office administration. Please submit cover letter, resume and, if available, a writing sample to Jess Sterling at jsterling@chattahoochee.org. CRK has legal internships available year-round to law students for part-time work during the fall/spring semesters and full-time or part-time during the summer. A legal internship with CRK will provide a wide spectrum of experience that will transfer to future environmental-related work opportunities. Legal interns work under the close direction and supervision of our staff attorney, but also have opportunities to work in collaborative efforts with other staff and outside organizations. Work will include legal research and writing, advocacy and policy work, field investigations, stakeholder meetings, and involvement with litigation. Funding may be available for paid internships. Experience and/or course work in environmental law, water resources, environmental justice and the Clean Water Act is recommended. Please submit cover letter, resume and, if available, a writing sample to Kevin Jeselnik at kjeselnik@chattahoochee.org. CRK has other opportunities for interns to become involved and help promote our mission. Interns at CRK are given opportunities that are hands-on, demanding and rewarding. We offer internships with experience in a variety of fields such as environmental policy, chemistry, ecology, education, office administration, fundraising, cleanups, field work and special events. Internships are unpaid, but offer real world experience in the non-profit business world and provide exposure and education to the challenges facing our natural resources. CRK has a part-time social media curator internship available to students and recent graduates year-round. The social media curator will work closely with the Communications and Marketing Manager to promote CRK’s mission to protect and advocate for the Chattahoochee River via social media. Responsibilities include updating the website, drafting social media posts, researching trends and best practices, assisting with events and outreach opportunities, and more. The ideal candidate will have experience with social media channels, have effective communications and research skills and be highly organized. Photography skills and experience with InDesign, Illustrator and/or video editing software are a plus. At the end of the internship period, the Communications and Marketing Manager will provide a letter of completion to be used for future business references. Please submit a cover letter, resume, two references and three writing samples to Becca Powell at rpowell@chattahoochee.org. CRK has a part-time promotions and events internship available to students and recent graduates year-round. The promotions and events intern will work closely with CRK’s development team to help execute promotions strategies, assist in the creation of marketing content, assist with fundraising efforts, and help procure and organize supplies for events. The promotions and events intern will also assist in advocating for the Chattahoochee River at outreach and tabling events. The ideal applicant will have a passion for water protection, strong communications and research skills, and will be highly organized with attention to detail. Previous event planning experience is a plus. At the end of the internship period, the Development Director will provide a letter of completion to be used for future business references. Please submit cover letter, resume, two writing samples and two references to Becca Powell at rpowell@chattahoochee.org. CRK has a part-time office management internship available to students and recent graduates year-round. The office management intern will work closely with the Development Director and Development Associate to coordinate membership mailings, conduct a monthly merchandise inventory, assist in coordinating office and event volunteers, assist in research relating to fundraising and membership retention and acquisition, and ensure overall completion of administrative tasks and development projects. The office management intern will also assist in advocating for the Chattahoochee River at outreach and tabling events. The ideal candidate will have strong communication skills, be proficient in Office applications, and be highly organized. Database entry and volunteer coordination experience are a plus. At the end of the internship period, the Development Associate will provide a letter of completion to be used for future business references. Please submit a cover letter, resume, two references and two writing samples to Becca Powell at rpowell@chattahoochee.org. Sign up for our e-newsletter to keep up-to-date with the latest news from CRK.